We've had months to adjust to the news of a new administration. Millions have been shocked, heartbroken, and outraged. Millions of others are elated, have been enjoying seeing executive order after executive order signed, and are looking forward to more. For certain, there has rarely been such vocal and visible global protests reacting to the election of a single public official. The question we are faced with now is how to move forward after an extremely contentious election in a very divided country, with a president who did not win the popular vote and is evoking daily protests in the streets, at airports, and in town halls, with strong objections to his executive actions even from conservative voices. 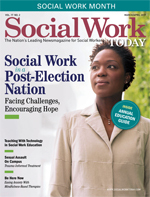 This issue's cover story, "Social Work in a Post-Election Nation," tackles this question by asking social workers and social work educators how the social work profession moves forward in a potentially unfriendly environment, as well as how social workers can work across differences and encourage open, respectful dialogue among various viewpoints. According to Richard P. Barth, PhD, MSW, dean and a professor at the University of Maryland School of Social Work, who was interviewed for the cover story, "We do need to recognize the importance of the diversity of the profession. People come to social work for a lot of different reasons, so we can't think there's only one way to achieve our goals. We aren't going to make the progress we need if we believe that we are all in agreement and only talk to others like us." When Donald Trump was elected president, NASW issued a statement congratulating him and acknowledging that "we must work with the new administration" on many issues. NASW also stated it "will hold Mr. Trump accountable for his promises." March is Social Work Month, and perhaps there has never been a more fitting theme than this year's: Social Workers Stand Up. Thanks to public education campaigns over the past decade, more people recognize the way social workers stand up for others. We can't predict the next four hours, much less the next four years, with the developments we have witnessed so far with this new administration, but we can predict for certain that social workers will be there to stand up and advocate for vulnerable people everywhere.